It is an unusual mid January for many reasons across the grain complex. One of the main reasons it’s unusual is because there was no final USDA report, which was scheduled for January 11th because of the US government shutdown. Often times the January report serves as a flashpoint for market action putting the final numbers on the previous year’s crop. This year, with the USDA report canceled or postponed all of this drama has been muted. The grain futures market simply forges ahead based on information known and unknown. With the USDA reports on hold, it is somewhat interesting to look at trade estimates to see where the numbers might be. The last crop numbers we had were from November when the USDA had predicted 178.9 bushels per acre for corn and 52.8 bushels per acre for soybeans. This gave respective US domestic production of 14.626 billion bushels of corn and 4.6 billion bushels of soybeans. Trade estimates vary as expected, but Reuters pegged both corn and soybeans to be down slightly at 178 bushels per acre for corn and 51.8 bushels per acre for soybeans. That certainly doesn’t have the drama of the flashy USDA report, but it does imply some difficulties in late fall harvest fields that will show in reduced yield. Trade estimates are also varied with regard to the stock numbers that would’ve been released on January 11th. Looking back a month ago, the USDA had pegged corn ending stocks at 1.781 billion bushels, soybeans at 955 million bushels and wheat at 974 million bushels. Trade estimates from Reuters have cut both the corn and soybean trade estimates slightly, while raising the wheat estimate. It is unfortunate that these USDA numbers are not available, but keep in mind when they do become available; it is unlikely to change a very bearish situation. On January 18th, corn and wheat futures were higher than the last Market Trends report. Soybeans were lower. March 2019 corn futures were at $3.81 a bushel. The March 2019 soybean futures were at $9.16 a bushel. The March 2019 Chicago wheat futures closed at $5.17 a bushel. The Minneapolis March 2019 wheat futures closed at $5.74 a bushel with the July 2019 contract closing at $5.28 a bushel. The nearby oil futures as of Jan 18th closed at $53.80/barrel up from the nearby futures of last month of $51.20/barrel. The average price for ethanol on January 18th in the US was $1.48 a US gallon down from $1.52 last month. The Canadian dollar noon rate on January 18th was .7541 US, less than the .7474 US reported here last month. The Bank of Canada’s lending rate remained at 1.75%. In Ontario the corn and soybean harvest continues. In fact, cold weather and lack of snow through late December and early January did help get many soybeans harvested. Corn harvest continues in a very difficult season in southwestern Ontario mainly because of the problems that have been experienced with high VOM. Markets have opened up for some of this corn at high discount levels. Of course, some of this corn has been destroyed. As of mid-January there are still fields left to harvest, a difficult legacy to the problematic growing season 2018. The VOM situation in 2018 has been more than challenging for farmers. The situation has been more than difficult partly because of the degree of infection versus past years. In 2018 there was more VOM affected corn than there had been before. In fact, the Grain Farmers of Ontario have estimated $200 million worth of damage. Clearly, producers are looking for Plan B options in 2019 and beyond regarding risk management alternatives. As farmers, we cannot afford those losses again. Until the government shutdown is over and the USDA gets back to publishing numbers, we are operating in a bit of a vacuum. The argument can be made that the USDA numbers in their major report serve as flashpoints for traders and noncommercial speculators. In lieu of that, others believe that the market gives a truer indication of where we are by analyzing grain future spreads. There are bits of truth in both of those points, quarterly stocks unpublished leaves the demand picture unclear. Keep in mind; the futures market is the truth, where actual transactions take place. Generally speaking, we find out later why it reacted the way it did. Despite that reality, it is still important to immerse ourselves in market factors that matter. Soybeans are one thing well documented, but corn is a totally different animal. The fundamental outlook for corn is completely different than soybeans. Add the dryness that we are seeing in Brazil now and it just gets more so. Sure, we are still in the sideways range, but cash prices in the United States are currently near the highest price in the last seven months. The soybean market is captive by Chinese trade rumors with United States. In fact, you could almost say that it’s strangled by the specter of trade war peace, which seemingly never comes. We all know that there is a March 1 deadline set by the Americans for a trade agreement with China. China responded initially by buying about 5 MMT of soybeans, which got the market excited. However, that essentially got people interested, but at the same time reduced Brazilian soybean premiums. Earlier in January, those premiums had been reduced to $4/Tonne, where they had been $20 a tonne earlier. With Brazilian soybeans planted earlier this year, China should be able to resume buying when the current harvest gets to port in February or March. The rumours in the soybean market are almost comical. For instance in the week ending January 18th, the Americans were said to be offering reduced tariffs on Chinese goods, while the Chinese were offering a commitment to major agricultural purchases over the next six years. Of course, the ports in the Pacific Northwest of the United States are still silent. We need real tangible fresh news, which is credible to start the road back to normalcy in the soybean market. Corn is in a very familiar place. In essence, we’ve been trading sideways and range bound since 2014. There is the argument that corn futures will need to trade higher in order to garner more acres in 2019. However, this range bound time period has been difficult to break thru. In the past few years corn futures have topped out in late spring, for instance May 29th in 2018, early July in 2017 and June 18 at 2016. Its may happen sooner in 2019 as there will need to be an earlier economic incentive to encourage those corn acres to be planted. The March 2019 May 2019 corn futures spread as of January 18th was – $0.0825, which was considered sideways. The nearby corn futures contract is currently priced in the 37th percentile of the past five year range. Seasonally, corn prices tend to trade higher into June. The soybean market has been extremely jittery reacting violently on every little tidbit of news regarding a potential deal with China. However, there are no mass shipments of any soybeans to the Pacific Northwest export facilities in the United States. Until that happens, the market will probably react in the same way to these Chinese trade rumors as the two governments negotiate into March 1st. Of course, no deal will be colossally bearish. With the government shutdown in the United States we are only musing about the amount of soybean ending stocks, which are still there. China will remain key to bringing those mountains down. The hot and dry weather in Brazil might ultimately have an effect, but even though production estimates have decreased, we can still expect a big crop from South America. The March 2019 May 2019 soybean futures spread as of January 18th was $0.1325 cents, which is considered bearish. The nearby spot contract is currently priced at the 15th percentile of the past five-year distribution range. Seasonally, soybeans tend to trade higher into June and July. We know that there is a lot of wheat in the world even with the government shutdown delaying USDA numbers. Future spreads are a good indication of what the market is saying. These spreads have been supportive in both Chicago and Minneapolis where the futures prices are determined for Ontario’s wheat crops. There were even rumours within the market last week that China would be interested in buying American wheat. However, that would be unusual and might be a product of the many rumours coming out of those trade negotiations. In Ontario, wheat prices have been supported by the relatively low Canadian dollar fluttering in the 74 and $.75 US level over the last month. The crop planted in the ground now has a layer of snow on it, which hopefully will foster an environment to protect the wheat until spring. There are many farmers hoping that the wheat will appear in spring even though it wasn’t very evident last fall. 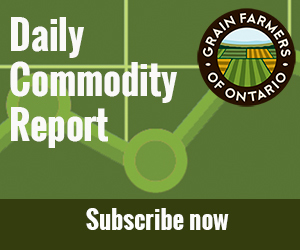 The Canadian dollar remains a stimulus for Ontario cash grain prices. Generally speaking it reacts in an inverse fashion to the value of the American dollar. However, there are always variations on that theme. Currently, with the Canadian dollar fluttering in the 74 and $.75 range it is in sync with the rising US dollar. Of course, foreign-exchange markets have their own set of fundamentals and the specter of a hard Brexit from EU looms on the horizon. This would be bullish for the US dollar, which would likely weaken the Canadian dollar. If the US government shutdown continues, it will also be detrimental to the US economy. As usual, there are a myriad of factors affecting these foreign-exchange values. That is one reason that flat cash grain pricing has become so popular for Ontario producers. Those flat prices in Ontario as of January 18th range from approximately $4.90 to $5.20 for a bushel of corn off the combine next fall. FOB bids would be higher than that. Soybeans are reflecting some of their bearishness with bids of approximately $11.80 as of January 18th. Clearly, we know that basis has declined in soybeans over the last month and we also know of the myriad of various factors affecting the soybean futures market. The question we need to ask ourselves is where will these flat prices for grain be if the Canadian dollar rises into the $.80 level and beyond in the next eight months? In the next few weeks, we are likely to see the United States government open again and with that a release of USDA final numbers on 2018. That usually is an explosive time in markets, but it may be mitigated this year. At the same time we are likely to get some resolution, hard or soft to Brexit, which should boil foreign-exchange markets. We also have the dry and hot weather, which continues to inundate Brazil soybean country. USDA had predicted 122 MMT crop in Brazil, but private forecasting agencies are whittling this down. The degree of hot dry will certainly impact these markets. There is also the specter of surprises in US planted acreage in 2019 coming up in the discussion. When they were last heard from, the USDA had pegged 2019 corn acreage at 92 million and soybean acreage plummeting to 82.5 million. These all will remain market factors in the background as we move forward. The challenge for Ontario farmers is to immerse ourselves in all of these market factors to hone our marketing risk management plans further. The VOM situation in Ontario has added another layer to consider within our crop marketing plans. However, there is no rest as grain continues to be grown and moved in places like Brazil, Argentina, the United States, Russia, Turkey, the EU, Australia and China. Daily market intelligence will remain key. Risk management never gets old. Philip Shaw farms near Dresden, Ontario. He is the author of the Grain Farmers of Ontario Market Trends Report published 14 times per year. He speaks on grain prices across Canada and his commodity commentary can be read regularly in several publications.